Yatika Starr Fields, is a Painter and Muralist. 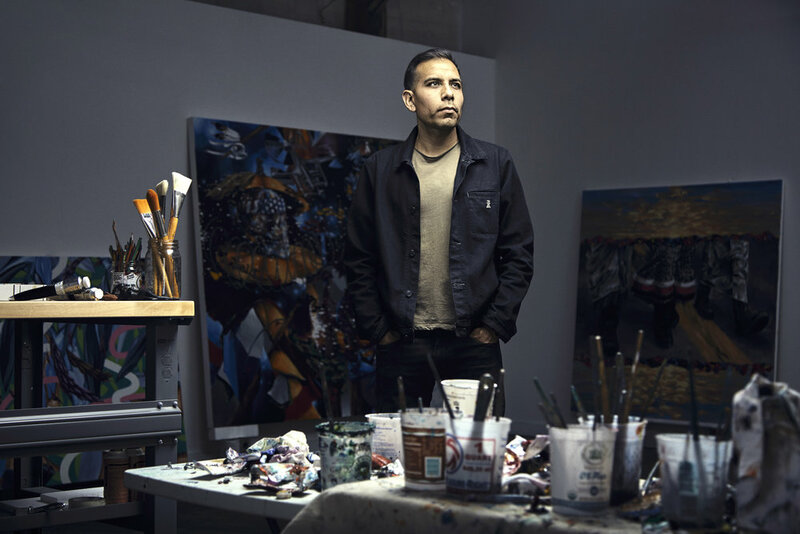 While attending the Art Institute of Boston from 2000 to 2004, he became interested in Graffiti aesthetics, which has been integral to his knowledge and process along with Landscape painting- and continues to influence his large- scale projects and studio works. Fields is from Oklahoma and currently living and working in Tulsa in conjunction with the Tulsa Artist Fellowship. Fields has spent the last decade on the East Coast, New York City and most recently Seattle where the energy of urban life inspires and feeds the creative force in his artwork. He seeks to influence his viewers to rethink and reshape their relationships to the world around them. His compositions are often spontaneous and left open for interpretation so that multiple stories can be drawn from them. His kaleidoscopic imagery, with its dynamic pop, symbolism and culture aesthetic, reference both historical and contemporary themes- tied together with traditional affinity but provoked by general concerns of world differences. His canvasses and Murals are alive with movement and filled with images that rely on vibrant colors and swirling patterns to build narratives that carry the eye.